A new Statistics Canada study, "Women-owned Enterprises in Canada," provides the first comprehensive overview of women-owned enterprises in Canada using a new linked administrative database — the Canadian Employer-Employee Dynamics Database (CEEDD). The CEEDD links businesses to their employers and to their owners, thus allowing for the first time, a detailed analysis of business owner characteristics, including by gender. The database currently includes information up to 2013 and represents an important first step by providing a historical perspective on women-owned enterprises in Canada. It will be updated as new information becomes available. According to the results of the study, there were 275,300 women-owned enterprises on average each year from 2005 to 2013, employing 828,700 workers. Women-owned enterprises accounted for 18% of all private enterprises and 15% of employment in private enterprises (for which the gender of business ownership could be identified). In contrast, there were over one million men-owned enterprises on average each year from 2005 to 2013, accounting for 4.1 million employees. These enterprises represented 67% of all private enterprises and 73% of employment in private enterprises. 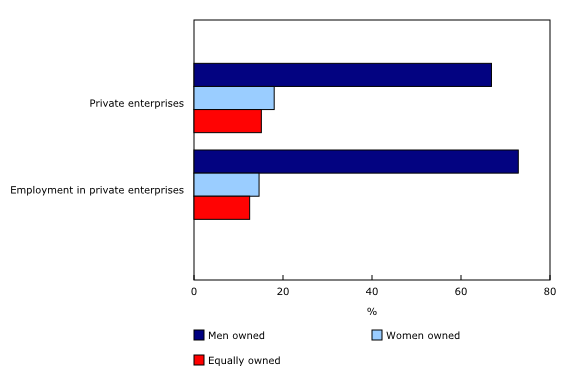 Despite the significant difference between the number of women- and men-owned enterprises, the number of women-owned enterprises (+33%) and the employment in these enterprises (+20%) increased at a faster pace relative to men-owned and equally-owned (women and men) enterprises from 2005 to 2013. Equally-owned enterprises (enterprises owned by both women and men) saw similar growth (+32%) in the number of businesses, but slower growth (+12%) in employment. In contrast, the number of men-owned enterprises grew 22% and employment in these enterprises rose 8%. 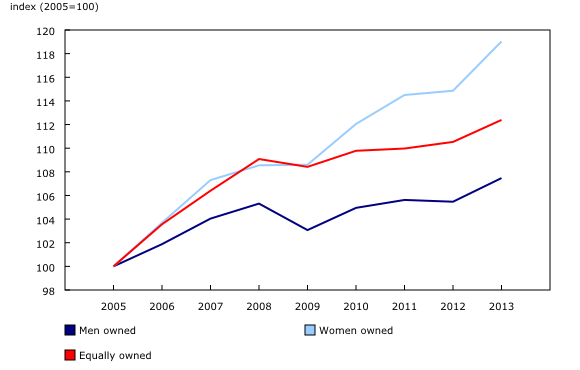 Gender in business ownership varied considerably across Canada and industries. Women-owned and equally-owned enterprises were more prevalent in Western Canada, where their shares were higher than the national average. 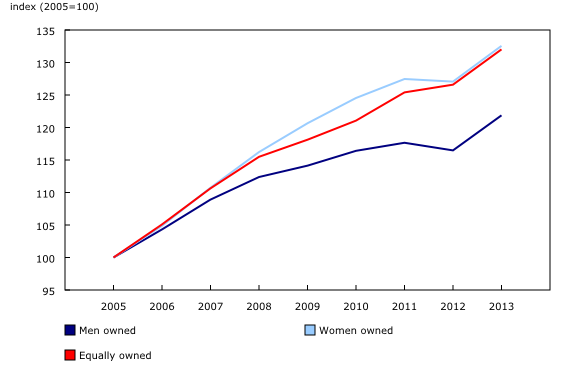 From 2006 to 2013, the total share of women-owned and equally-owned enterprises was lowest overall in Quebec at 24% and highest in British Columbia at 39%. While the number of these enterprises increased at a faster pace than that of men-owned enterprises across Canada, the number of women-owned enterprises grew fastest relative to men-owned enterprises in Nova Scotia, British Columbia and the territories. Women-owned enterprises were more prevalent in service industries, such as educational services; health care and social assistance; and arts, entertainment and recreation. In contrast, men-owned enterprises were more prevalent in goods-producing industries such as agriculture, forestry, fishing and hunting; mining, quarrying, and oil and gas extraction; utilities; and manufacturing. The share of women-owned enterprises was highest in the educational services industry (35%) and lowest in the construction industry (7%) from 2005 to 2013. The number of women-owned enterprises grew much faster relative to that of men-owned enterprises in most service industries, with the fastest growth in education and health care and social assistance. Women-owned enterprises were also more prevalent in small enterprise categories (enterprises with no employees, fewer than 5 employees, and 5 to 19 employees). Women-owned enterprises accounted for 17% to 19% of enterprises within those categories, while they represented 11% of enterprises with more than 100 employees. The research article, "Women-owned Enterprises in Canada," which is part of Economic Insights (Catalogue number11-626-X), is now available. Also released today is a technical paper titled "The Measurement of Business Ownership by Gender in the Canadian Employer–Employee Dynamics Database," which is part of the Analytical Studies: Methods and References (Catalogue number11-633-X) series. To enquire about the concepts, methods or data quality of this release, contact Danny Leung (613-951-2574; danny.leung@canada.ca) or Huju Liu (613-407-0589; huju.liu@canada.ca), Economic Analysis Division.